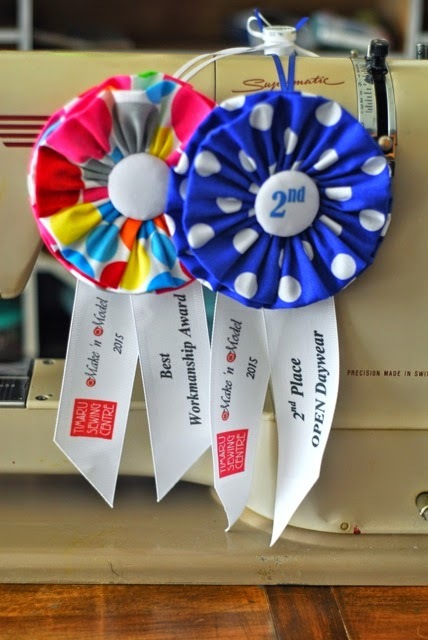 For a lark, and on a friend's recommendation, I entered the Timaru Sewing Centre's Make'n'Model competition. The making part was easy, with the dress and jacket being ready by the end of the summer holidays. The modelling part, as all those involved realized on the day, was a little more nerve-wracking as we had to become ramp models and display our finished garments on a catwalk. It was a great evening of fashion though and well organized by the Sewing Centre - hats off to them for all the hard work leading up to the event! Nick kindly photographed me as part of the entry requirements. I hadn't been too sure that the dress had been a success (you know how it is if you sew - it didn't turn out as I'd pictured in my head) but seeing the photos gave me a bit more confidence that it looked just fine. The jacket was the easy part - I had this piece of grey wool in my stash which I bought from an op-shop for about $5. I love how wool throws itself together! I was genuinely surprised to win second place in the "Open -> Daywear" category, ie open age group, and an outfit suitable for any daytime activities. Even more so to win the special award of "Best Workmanship". Thanks to the Timaru Sewing Centre for some really great prizes! Congratulations!! The jacket looks most professional, and the dress has a lovely "flow" to it. Good colours as well i.e. from someone who enjoys well made clothes.